"If he had opposable thumbs he'd be unstoppable." That describes the German Shepherd Dog's insatiable appetite for work in a nutshell: ask him to jump, and he'll ask you how high. The world knows him as Rin Tin Tin, the rescued war-pup-turned-celebrity-dog of Hollywood's Golden Age. But he's a demanding fellow, a whole lot of dog, who stays an adolescent until the age of two. The German Shepherd is intelligent and hardworking and thrives with a human who shares these traits, but does not come ready made. And in spite of your own intelligence and work ethic, if you're an uninitiated pet owner the shepherd is probably not your best first dog. The German Shepherd Dog is also known as the GSD, or simply, shepherd. German Shepherd mixes may be available from shelters and rescues. While a German Shepherd Dog mix may share common physical traits and temperament with GSD, any number of other breeds characteristics may also be present. DNA testing is usually not standard in most shelters, so breed mix is usually a best guess based on appearance and any information provided by previous owners when the dog is surrendered. If you want to adopt a German Shepherd mix or AKC registered GSD, contact shelters or rescue groups to let them know know you are interested, as the breed is popular and is often adopted quickly. It is important to note that even in an AKC registered German Shepherd, a single dog's personality may differ from the breed standard based on his unique genetics, experiences, training, and socialization. Common German Shepherd Dog mixes include Golden Retriever, Labrador Retriever, Rottweiler, Siberian Husky, and Poodle. 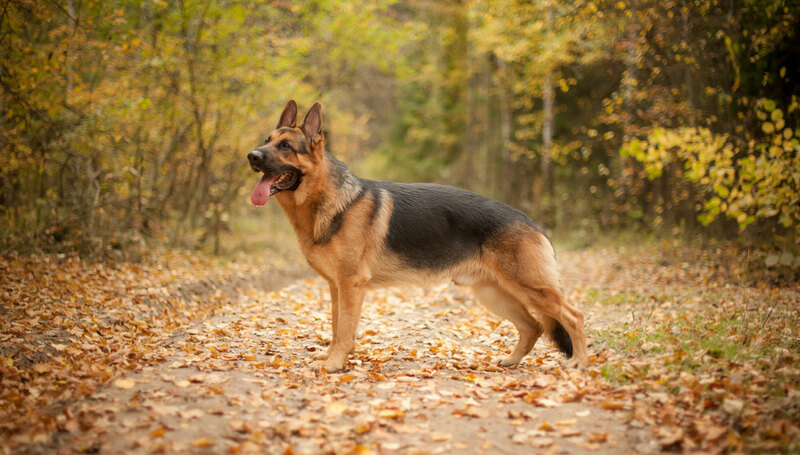 Coat - Most German Shepherd Dogs have a thick, medium-length double coat, which is an adaptation to cold climates, but the length of the coat varies from dog to dog. The topcoat is dense, with typically straight hair lying close to the dog's body, although it can be wavy. The undercoat is wooly and insulating. Color possibilities include solid black, black and cream, black and red, black and silver, black and tan, blue, gray, liver, sable, and solid white. The German Shepherd is longer than he is tall, the most desirable ratio being 10 to 8.5. He has a noble, somewhat chiseled head that is proportioned well to the rest of his body. He has dark, almond-shaped eyes and erect ears; his expression should be keen, intelligent, and composed. His chest is deep and capacious, his abdomen firm and never 'paunchy.' The German Shepherd tail is bushy and at rest hangs in a slight curve. This dog possesses a distinctive trot that is effortless and buoyant, smooth and rhythmic, like the movement of a well-oiled machine. He does not hurry, but can be fleet of foot when the situation demands it. The German Shepherd dog originated in 1899, created by Max von Stephanitz, a career captain in the German cavalry. In the region where von Stephanitz lived, farmers desperately needed reliable livestock herders, but there was no distinct dog breed to do this important work—people instead traveled great distances to find good genetic stock to produce a working dog, so von Stephanitz set out to select for those traits in a single, recognized dog breed. When he came across a 'wolf-like' dog at a dog show in 1899, von Stephanitz immediately bought him, naming him Horand v Grafeth and founding an organization to create an exceptional herding breed from the dog's descendants. Later von Stephanitz shifted trait selection with an eye to police and military work, after industrialization diminished the need for herding dogs in Europe. Over time, as von Stephanitz observed a decline in the traits for which he had so carefully selected—problems including poor dentition and other temperament and health issues—he established a tight set of breed standards to bring the dog back into alignment with his original vision. The American Kennel Club (AKC) first recognized the German Shepherd in 1908, but American breeders never complied with von Stephanitz' breed standards and the two 'versions' of the shepherd began to diverge after the Second World War. Americans who needed exceptional shepherds often imported them from Germany, but in recent years American breeders of the German Shepherd Dog have attempted to improve the quality of the breed and to focus once more on the dog's aptitudes and less on his appearance. A sound German Shepherd should be direct and fearless, but not hostile or pugnacious; self-confident; aloof; and poised, but eager and alert. While the GSD is discriminating in his alliances, he is loyal to a fault once he elects to include you within his fold. He is exceedingly intelligent and trainable, devoted, protective, and can be fun-loving. He will alert you to visitors, but will accept them into your home once he's satisfied they pose no threat. He craves human attention and does not enjoy being left alone for long periods—he will self-console in ways that can include property destruction if you leave him to his own devices. He yearns to be part of your family, and wants a job to do, however small or inconsequential: teach him to bring you your slippers you'll never need to go and find them again. Are German Shepherds Good with Kids? The German Shepherd Dog makes an exceptional companion for children, especially when he's exposed to them early, and you socialize him. Sometimes called a cross between a babysitter and a cop, he is at once gentle and protective. But while he is trustworthy around the children in his family, because of his size alone he can unintentionally injure a small child, so be vigilant if a GSD and young children live together in your home. Are German Shepherds Good with Other Pets? While the prey drive is strong in some GSDs, your shepherd will probably coexist peacefully with other pets in your home if he was introduced to them when he was still a puppy. And because he was bred for herding, he also does well with livestock and farm animals, will trot happily alongside your horse while you ride, and will even help you put the horse away when you get back to the barn. Are German Shepherd Dogs Good Guard Dogs? The answer is an emphatic yes. Not only does the GSD possess a genetic predisposition to protect his family, but his aptitudes and trainability make him an ideal candidate for 'official' work as a guard dog, a role he has embraced enthusiastically since the First World War. On a scale of one to five—five being high-energy—most shepherds fall between three and five. He is a working dog, after all, and as such demands daily vigorous exercise. If he does not get it he'll turn to destructive chewing, and possibly neurotic barking, to assuage his boredom. Give him lots of outlets for his energy. This sensitive breed reacts poorly to noise, chaos, and reprimands. He has a strong inclination for 'mouthiness' until you redirect this undesirable behavior. He can have a strong prey drive. He sheds copiously all year long, and 'blows'—or heavily sheds—his undercoat twice a year. He can be aloof and suspicious: do not choose a GSD if you want a welcoming committee for guests—he may be more interested in protecting you from them. Without plenty of exercise and a job to do he may turn to destructive behavior. With his low tolerance for alone time, this highly social creature makes a poor candidate as an 'outside' dog. Indoor The German Shepherd Dog wants to be indoors with you and your family, and adapts well even to apartment living, so long as you get him outdoors for a good romp every day. But left alone for long periods he may turn to destructive chewing and neurotic barking. Obedience and crate training are crucial for the GSD, in any kind of living arrangement. Outdoor The German Shepherd was developed with a coat that protects him from the cold, so he easily tolerates it. He tolerates heat moderately well in spite of his heavy coat; keep an eye on him and make sure he has access to plenty of water. But vigorous outdoor activity is requisite for this dog—don't be afraid to play outside with him in any season. Exercise Daily vigorous exercise is a must for the German Shepherd, whether it's in your own back yard or out and about. Two half-hour daily walks along with a vigorous play or obedience session is a good start. But be advised: until about seven months of age, your developing shepherd's bones need protecting—resist over-exercising him, even if he tells you he can keep on going. And wait to play on hard surfaces, for example, asphalt or concrete, until he's two years old, when his bones and joints are fully formed. Endurance Because this breed was developed for work, the German Shepherd can rise to just about any occasion where endurance is required. Running Miles: Once conditioned, GSDs can sustain a nice pace at the trot and can easily handle a 10-mile run. If you are an avid runner, this dog is an excellent choice: he'll enjoy the companionship, the mental stimulation, and the workout. Hiking Miles: Once conditioned, the GSD can easily manage long distance hikes with you, covering as many as 15 to 30 miles, and is especially welcome among hikers when he is obedience trained. If he's at least two years old, ask him to wear a backpack and carry some supplies: this working breed will gladly comply. Food German Shepherds are not prone to obesity, and in fact, a lean and muscular dog may avoid some of the joint problems that come with age. The recommended diet for an average GSD is three to four cups of dry kibble daily, but adjust these rations as indicated by his activity level, size, age, build, and metabolism. A German Shepherd puppy should be fed a high-quality, low-calorie diet to help him maintain a normal growth rate. Consult your veterinarian to help fine-tune your shepherd's diet. Alone Time German Shepherds do not tolerate long periods left alone. Welcome your shepherd into your home and family, or choose another breed if your lifestyle will not allow it. Your shepherd will develop undesirable behavior stemming from his anxiety if you leave him in isolation. This double-coated breed is a heavy shedding dog. Only occasional bathing is called for, but brushing at least once weekly is recommended. Brushing and bathing more frequently in the heavy shedding seasons of spring and fall will help reduce the amount of dog hair in your house and car, but you'll still need a good vacuum cleaner for a dog sometimes called the 'German Shedder.' The GSD is a poor choice for a household of humans with allergies. Watch for waxy buildup in his ears, which provides a perfect medium for bacterial growth and infection. Trim his nails every month, and brush his teeth regularly—if he'll tolerate it—for good dental health and fresher breath. You can minimize serious health concerns in a German Shepherd Dog by purchasing him from a reputable breeder who engages in responsible breeding practices, and through screening for common diseases and conditions. The German Shepherd Dog is an extremely intelligent and notoriously trainable breed: he does not suffer fools gladly, and he'll figure you out quickly. For this reason, training is not optional for German Shepherds, but essential. He is a versatile dog, excelling at anything he's trained to do—but train him you must. The German Shepherd can be trained for work in a multitude of military applications, for search and rescue operations, in the detection of bombs, narcotics, arson, human remains, and more, for personal protection, as service dogs for the disabled, as therapy dogs, and for work in airport security. Two of the best known sporting activities for German Shepherds are herding or herding trials, and Internationale Prüfungs-Ordnung (IPO), formerly known as Schutzhund, first developed as a test to determine whether a dog met the standards of the breed, but now more of a 'triathlon' of sorts. German Shepherds also compete in the Protection Sports Association (PSA) events, various types of obedience and agility competitions, tracking and nose work competitions, and a multitude of other sporting events for dogs. What do Germans call German Shepherds? Deutsche Shaferhund (Deutsche means German, shafer means shepherd, and hund means dog). Deutsche Shaferhund is pronounced DOY-cha SHAY-fer-hoond. For a time starting in 1917 the name 'German Shepherd Dog' was briefly truncated by the American Kennel Club to simply the 'Shepherd Dog,' a reflection of the stigma attached to all things German at the time. The Brits referred to the breed as the 'Alsatian Wolf Dog' for the German-French border area of Alsace-Lorraine. The AKC restored the name German Shepherd Dog in 1931, but the British Kennel Club did not follow suit until 1977. Was the German Shepherd developed as a police dog? The highly intelligent, protective, and trainable German Shepherd was developed to herd sheep, hence his name. But he earned a reputation as a superior messenger dog, rescue dog, and sentry during the First World War, and in turn became celebrated the world over as the best breed for guard duties, police and military work, search and rescue work, bomb and narcotics detection, and leading the blind. Why isn't white an acceptable color in a German Shepherd Dog? The thinking goes, white is too visible to make a shepherd an effective guard dog, and too camouflaged against sheep and snow to make him an effective herding dog. The official clubs and show breeders maintain that white is a disqualifying color for showing and breeding, but you can still register your white GSD with the AKC and show him in obedience and agility competitions. White GSDs tend to have a softer temperament that works well in many families. And there is a club for white German Shepherds, which holds its own confirmation shows. Do German Shepherds come in long-haired and short-haired versions? Yes, they do. But short hair is far more common in the GSD. And there are two types of each coat: a short coat can be very short, or a bit longer and thicker, in which case it is called plush. Either of these includes a coarser outer coat, and a wooly undercoat for insulation. The long coat comes with or without an undercoat, but its absence is generally considered undesirable, as shepherds were made to work outdoors in the cold.